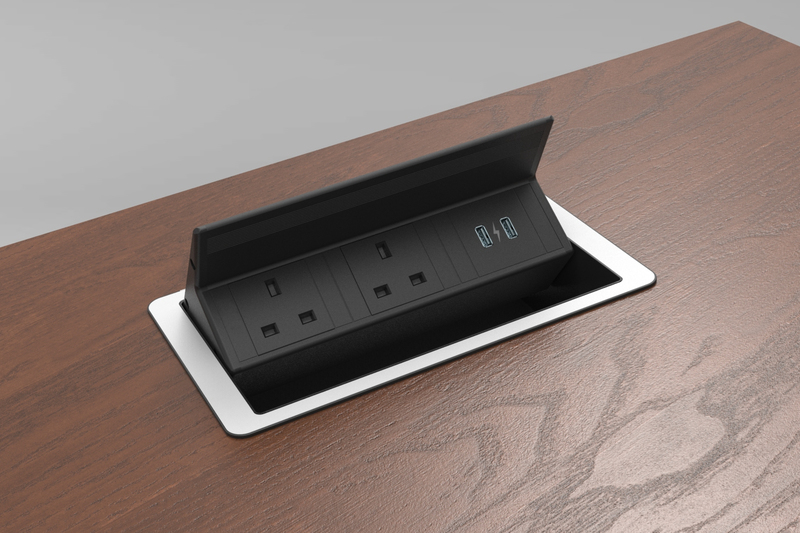 This stylish Flip up in-desk power module is configured with 2 gang sockets (13A, 250V)‎, 2 USB 5v charging as standard; all you need to do is choose which colour top to go with it! Whether you pick a top to match your d�cor or opt for a vibrant new colour to set it aside, this elegant Flip up in-desk power module will fit perfectly into any interior. To operate, simply push the top to release and then lift to open; and when not in use, push down to close and hide away. Providing the perfect desktop power supply for kitchen worktops, counter tops and table tops, it makes for a modern, elegant alternative desktop power supply for homes, offices and home office layouts. Cut out sizes can be found in the technical data. This unit has 3 working modules. Please note: The frame is designed to fit table thicknesses of 12-40mm and is manufactured from Aluminium and Plastic. We supply these units with UK 3 Pin sockets as standard; the images showing European sockets are primarily for showing the application in use. For more information, please contact sales.